At first glance collection might seem like the last thing you would want for a timed event, but let’s take a closer look. True collection occurs when the horse is in self-carriage. In true collection the horse is able to execute changes in speed or direction without losing his balance. A horse conditioned only for speed will lose agility and be harder to control because he can’t respond efficiently and quickly to the rider’s aids. The perfect example is the jumper that fights his rider all the way to the jump and, when finally released, jumps flat and takes down a pole. This type of horse may be more talented than he appears but often loses to the smoother more balanced jumper. In barrel events a horse that can’t collect will often run past the barrels or turn wide circles around them. 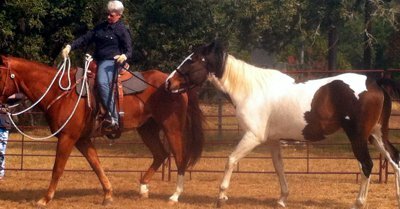 Ride on uneven terrain for all gaits so the horse learns how to carry himself and make adjustments as ground conditions change. Make changes of gait every few strides to help the horse pay attention and learn how to prepare himself for transitions. This is especially important for ex-racehorses who have to unlearn the habit of balance on the reins and running faster. Don’t overdo this exercise. Ride up and down the sides of hills. If possible incorporate turns while riding the sides of slopes. Lateral Work: For a horse to move forward and laterally at the same time he must balance himself to keep from falling. The leg yield, shoulder-in, haunches in, and the more advanced half-pass will help develop self-carriage. Work over poles or small jumps to encourage the horse to lower his head and lift his back. Make small circles, serpentines and spirals. Horses must balance themselves to make tight turns so rather than working on straight lines, which can encourage a horse to lean on his forehand, ask him for frequent changes in direction starting with a large circle and spiraling into a smaller circle. Make sure you don’t let the horse balance on the reins. Use your legs at the girth to keep the horse coming forward and up under himself. Speed without balance is dangerous to the horse and rider. An unbalanced horse cannot rate his speed and is more likely to injure himself if he tries to make an adjustment. Unbalanced horses that are ridden for any length of time will get sore because they have not developed the proper muscles to support themselves, much less a rider. Incorporating balance exercises into your strength and speed conditioning program will help your horse be a better athlete and lessen his chance of injury.